The 2018-19 international signing period begins today, and the Dodgers have added to their farm system. They are no longer under restriction from their spending spree of 2015-16 — when they spent more than $90 million (taxes included) to acquire the likes of Yadier Alvarez ($16 million), Yusniel Diaz ($15.5 million), Omar Estevez ($6 million), Starling Heredia ($2.6 million), Ronny Brito ($2 million) and Yordan Alvarez ($2 million, who was traded to the Astros for Josh Fields at the 2016 trade deadline). Over the last couple years, the signings have been plentiful, but because they were limited to spending no more than $300,000 on a single player, they weren’t in a great position to land impact prospects. That restriction is now gone, but they can only spend $4,983,500 million on prospects this period unless they acquire more slot money (up to 75 percent of the allotted amount), but teams are becoming more and more reluctant to part with much of that money. The Marlins and Orioles are infamous for doing that, so maybe there will be some money to be had there. Also, bonuses of $10,000 or fewer don’t count toward the pool. Finally, players who are 25 or older don’t have their bonus amounts counted toward the pool. Onto the signings, one of which is very exciting. Diego Cartaya has been linked to the Dodgers for more than a year, and they finally landed the Venezuelan catcher by giving him a $2.5 million signing bonus. He’s the first Dodger international amateur signee to get a 7-figure bonus since Yordan Alvarez. Cartaya is lauded for his high baseball IQ, natural actions behind the plate and maturity. He was ranked in the Top 3 of all three sites that rank international prospects — No. 1 by MLB Pipeline and No. 3 by both Baseball America and FanGraphs. Here’s what each had to say about him. Pretty glowing reports, especially for a 16-year-old. And the Dodgers have done a great job developing catchers, so it’d be surprising if he doesn’t at least make it to the majors one day. That’s a bold thing to say about a kid who’s just old enough to get a driver’s license, but the Dodgers worked their magic with Keibert Ruiz, and I’m anticipating they’ll do the same with Cartaya. Jermling Rosario, also 16, is from the Dominican Republic. Like Cartaya, Rosario is advanced for his age in terms of maturity and approach. He was ranked 30th by Pipeline, 23rd by BA and 22nd by FanGraphs. Here’s what they said. FanGraphs didn’t have a report on him, but they said gave his athleticism a “plus” and his frame a “minus,” which isn’t terribly surprising because, you know, he’s 16. But he has a chance to grow like most teenagers. He still has a projectable frame and should add velocity over the coming years. Some good things to like there with Rosario. The offspeed stuff, obviously, needs work, but you can see the makings of a solid prospect. 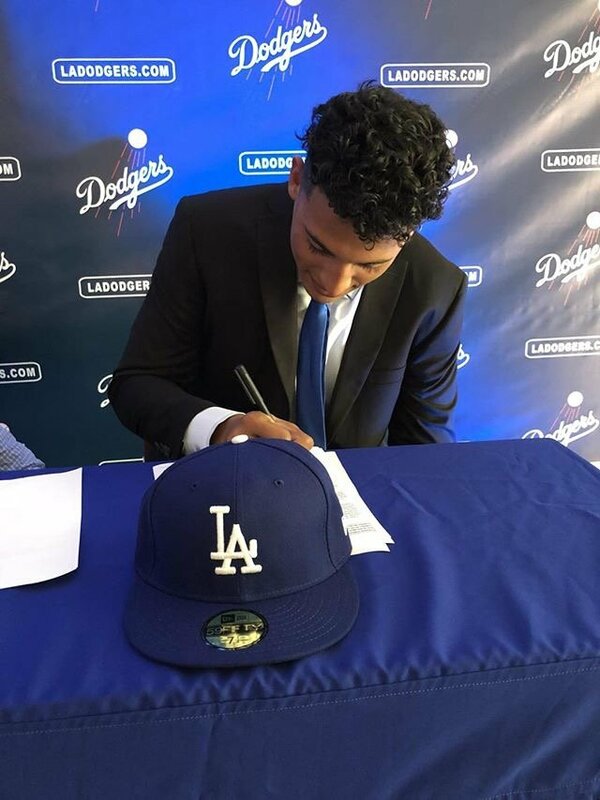 Ben Badler of Baseball America also reports the Dodgers signed Dominican third baseman Alex De Jesus (16, 6-foot-2, 185 pounds) and are linked to Venezuelan shortstop Miguel Droz (16, no vitals available). Here’s some video of De Jesus. He has broad shoulders for a 16-year-old, so not only could you see him adding some bulk as he matures physically, but that could also translate into power. In his swing, his upper-half needs to be smoothed out a bit, while his lower-half isn’t incorporated much. I’m sure that will change over the next few years. The 16-year-old has some defensive chops, but he’ll have to improve his actions (throwing motion, footwork) if he’s to stick at shortstop. We’ll have more signings as they become available.